'Madame de Pompadour Embroidering' by Charles-André van Loo, painted between 1750-1755. Copyright Hermitage Museum, St. Petersburg. 'Madame de Pompadour Embroidering' is a painting by the French artist Carle or Charles-André van Loo (1705-1765). It shows Madame de Pompadour behind an Ottoman-Turkish embroidery frame. The painting dates to AD 1750-1755. Jeanne-Antoinette Poisson (1721-1764), better known as Madame de Pompadour, was the official mistress of King Louis XV of France (r: 1715-1774). There are numerous paintings of Madame de Pompadour, including one that shows her embroidering with a tambour hook ('Madame de Pompadour at her Tambour Frame'). 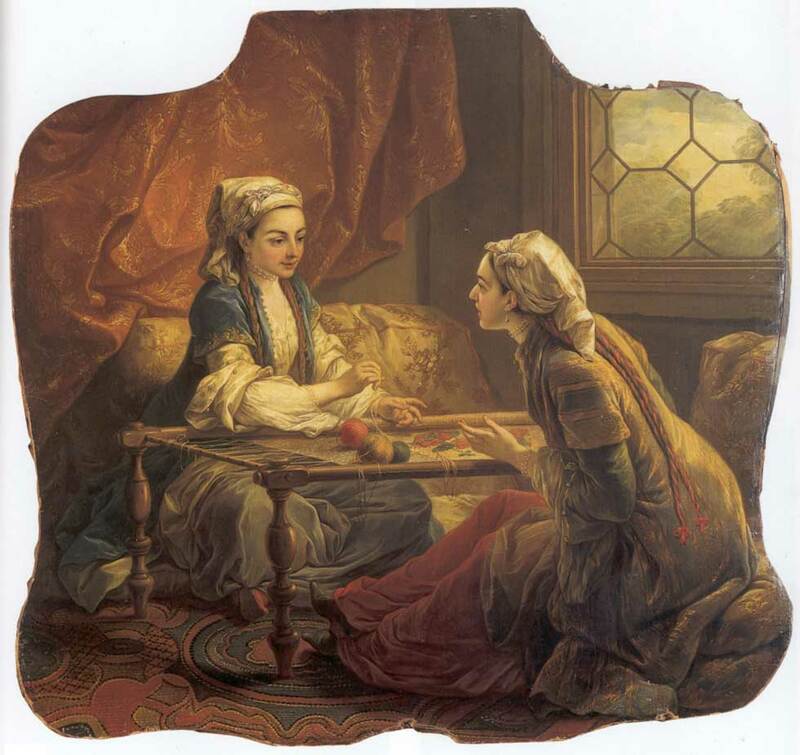 This particular painting by Van Loo, illustrated here, shows her working on a Turkish embroidery frame. She is depicted while embroidering using a rectangular embroidery frame with short legs, called a gergef, a type that was used extentively in the Ottoman Empire. The type of embroidery being worked is not clear. Van Loo painted several oil paintings of Madame de Pompadour in elaborate Ottoman Turkish dress, and in a mock Turkish haremlik setting. The painting has various names, including: (i) Madame de Pompadour Embroidering, (ii) Sultan’s Wife Embroidering and (iii) Two Odalisques Embroidering. The painting was acquired by Catherine II of Russia (r: 1762-1796) and later became part of the collection of the Hermitage Museum, St. Petersburg. KRODY, Sumru Belger (2016). 'Ottoman Turkish embroidery,' in: Gillian Vogelsang-Eastwood (ed. ), Encyclopedia of Embroidery from the Arab World, London: Bloomsbury Academic. MARICA, Denise Kalolaina (2007 ). Private Images, Public Statements: Madame de Pompadour and the Court of Versailles, thesis Haverfort College, Pennsylvania, USA. Digital source of illustration (retrieved 29 June 2016).